The appearance of Fosjoas V9 electric unicycle, as the first model of two-wheeled intelligent scooter lived up to the expectation of millions of viewers and scooter-lovers. It has a special meaning to Fosjoas and the whole sector. Bernard was not exposed to any electric self-balancing scooter, and Fosjoas V9 is his first one and might be the most suitable for him. 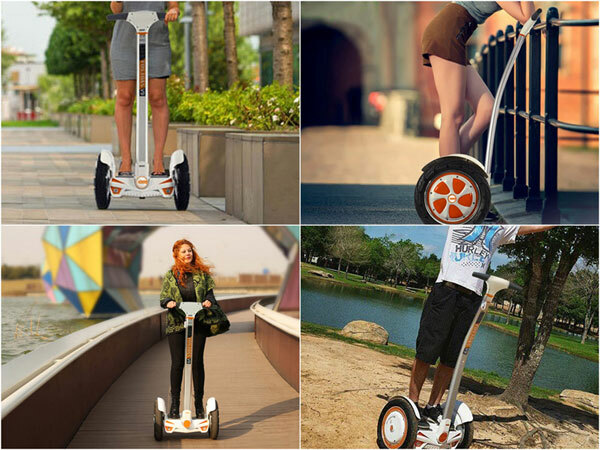 A large platform allows people of all ages and body types to settle comfortably into the riding position, feeling immediately at ease, as well as imparting the utmost in safety thanks to anti-slip devices placed under the feet. Bernard stood onto the platform and at once he could steer it smoothly and expertly. By leaning forth, he goes forward. His body leaning back, he automatically moves backward. The natural ride ability is the main draw of Fosjoas V9 self-balancing 2 wheels scooter. The attitude technology is innovatively applied to Fosjoas V9. A large 4'' LED display shows the Fosjoas V9's status and travel information at all times: mileage, current speed, battery level and ambient temperature. This way, Bernard always has everything under control and do not run the risk of any bad surprises as he is enjoying his V9. To increase its already high ease of use, the Fosjoas V9 electric unicycle high quality comes with a handy remote control that lets Bernard control the main functions, such as powering it on and off with one click, turning the headlights on and off, or the handlebar lights. What makes the Fosjoas V9 intelligent electric scooter special compared to products in other series is not the handlebars or immediate ride ability, but instead its incredible speaker system, capable of transmitting clear, undistorted sound, using Bluetooth connectivity to Smartphone, allowing Bernard to listen to his favourite music. Bernard has greatly enhanced his happiness index with his Fosjoas two-wheeled self-balancing scooter V9. Next：Fosjoas K2 electric scooter is full of humanized designs.